Customers connect with an email or social profiles. Sign-in screens change automatically depending on the customer. Facebook check-in is available instantly. *VivaSpot™ provides you with various marketing props such as door decals and stickers. Grow your customer email lists every day. Promote products, specials, and events automatically, or on schedule. 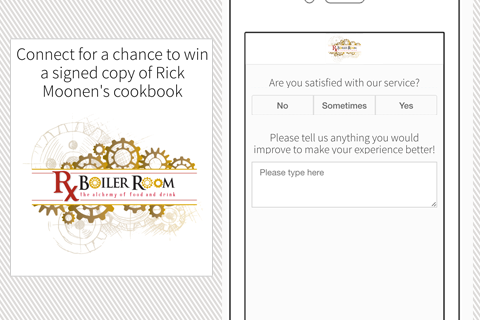 Instantly gather feedback, ratings and reviews. Improve segmentation with gender, age, spoken language. Reward first time, returning and loyal customers on the spot. Bring lost customers back with automatic emails. Integration with Google Pay, Apple Wallet, POS, 3d party APIs. Automatic follow up emails to drive walk-in traffic. Grow social presence and influence with exit clicks. Drive customers to Yelp Reservations, Eat24 and Open Table. Reach wider audience with Yelp deals. Many businesses offer free or password-protected WiFi to their customers not realizing that they may be not PCI DSS Compliant and could be facing fines up to $200,000 per month! VivaSpot™ Access Points are made by Cisco and are fully PCI DSS 3.0 Compliant to protect you and your business. 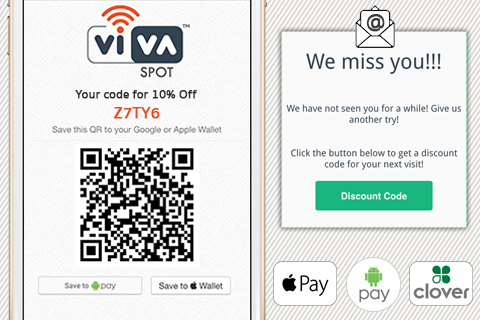 VivaSpot™ provides your customers with unique journeys as they are connected to your WiFi. Depending on the visits, social profile, preferences and history, customers are guided to various marketing campaigns, providing you with valuable data on your business. 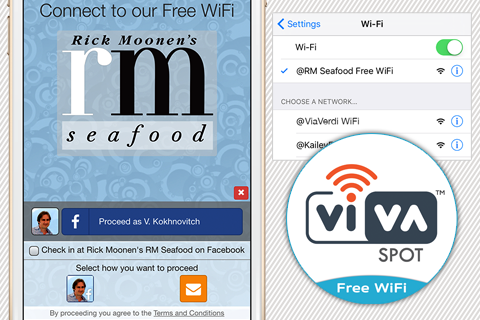 VivaSpot™ is the only WiFi solution integrated into leading POS systems. Full integration allows merchants to create and scan rewards directly on terminals. Other features include extended customer data, automatic order and customer assign, discount and spend tracking. Copyright © 2016 iValu8, Inc.